BEST TIME TO VISIT: Any time it isn't raining COMMENTS: Private property on both sides of highway 1 which passes through the middle of the town site. Parking very limited for cemetery. REMAINS: Cemeteries (Catholic and Protestant separate. One large old house at southern edge of townsite, east of highway. By the way, this town has a connection with another one on your site, Total Wreck Arizona. 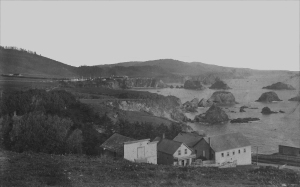 The town of Greenwood (now called Elk) about a mile south of Cuffey’s Cove, which more or less killed Cuffey’s Cove was a lumber company town. The “woods boss” in charge of logging operations around the turn of the century was E.B. Salsig, the same man who was saved by a bundle of love letters in a gunfight at Total Wreck Arizona a few years earlier. 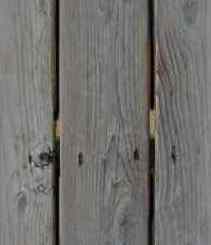 The company established a fairly permanent camp where their railroad met Alder Creek. This camp had many family residences and eventually got its own postmark (a Doane) I used to have a postcard which was postmarked Salsig California. When Mr. Salsig left the company in about 1913 the town or camp was moved to a sunnier location about half a mile upstream and renamed Manzanita (which also had a postmark) Cuffey’s Cove and Salsig appear on a 1913 map I have, but both are gone and Elk and Manzanita appear on a 1914 map. Elk is still in the Cuffey’s Cove judicial district. By the way, in verifying my information regarding Cuffey’s Cove you may find it spelled Cuffy’s. It really does not matter. It is not a family name or any other word with a proper spelling. The origin of the name is in dispute. One version is that Nathaniel Smith and Francisco Feria a pioneer of African heritage and his dark-skinned Portuguese friend had settled at this place in about 1852-54 and that Captain Fletcher referred to all Africans as “cuffys” which was supposed to be Australian slang for slaves. The other version is that someone in about the same time frame saw a bear “cuffing” her cubs on the beach at this place. Both these stories seem pretty weak to me. At least one person believes that it is an Anglicised Russian name. Cuffey's Cove in foreground and Greenwood/Elk in the distance.